Adapts Ford-application Performer EGR manifolds with square-bore carbs to work with emissions-legal stock EGR system (except 429-460). 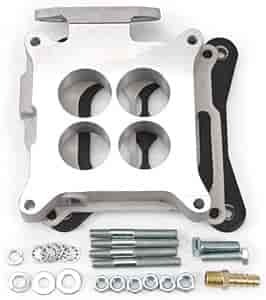 These Edelbrock EGR adapters allow you to install your existing EGR valve on an Edelbrock intake manifold and reposition it to gain clearance for your OEM or performance carburetor. They are available for Ford and GM applications, made of cast aluminum and come complete with gaskets and bolts! can you use a self tuning efi with this ? Self tuning can be used.